I was supposed to be going up to Mt Ruapehu this weekend, but pulled out at the last minute because I’ve not been feeling too well over the last week. I wanted to try and get some fresh air when I woke up yesterday morning, though, so I thought I might have a go at walking along as much of the Kaiwharawhara Stream as I was able to. Stream in Otari Wilton’s Bush. 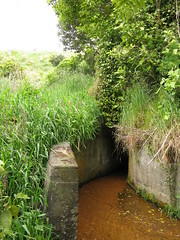 The Kaiwharawhara Stream is one of the main water catchments flowing into Wellington Harbour, and it’s named after the suburb of Kaiwharawhara, where it finally exits into Wellington Harbour. 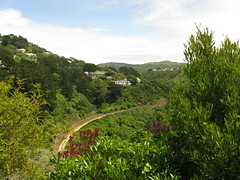 It collects most of its water from around Karori and (especially after joining with the Korimako Stream) from many of the western suburbs of Wellington below Mt Kaukau. Its path through that part of Wellington is quite diverse. 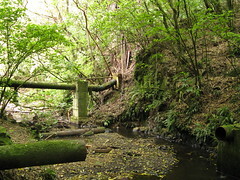 Some parts of the stream have a mildly remote feel to them, whereas others are heavily affected by built-up areas and the engineering projects that have caused it to be diverted and re-routed. Walking along it is a joining-the-dots exercise that I’ve wanted to do for a few months, and I’ve been waiting for a convenient time. 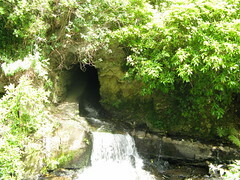 Ultimately I found several places where it was impossible to follow because it was piped underground for long distances. In several places the stream had no formed track, and I gave up on following it directly once it seemed unlikely that it’d go anywhere except into another underground tunnel. 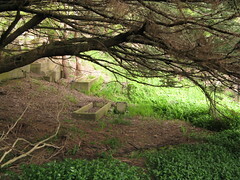 Location: Wellington’s Western Suburbs, from Karori Wildlife Sanctuary to Kaiwharawhara. 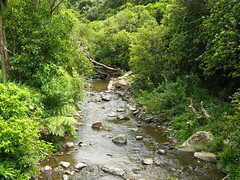 The main part of the catchment starts well up within the Karori Wildlife Sanctuary. There’s a charge to get into the sanctuary, and I’m also not 100% certain how accessible the stream is, so I instead decided to begin from just outside the sanctuary where the stream enters the free world. Note that I’ve put a lot more photos directly in this article than I usually do, because I think the photos tell much of the story of the changes in the stream from beginning to end. 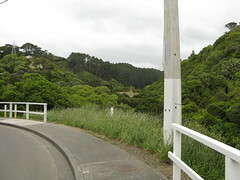 The easiest way to the stream from near the front of the sanctuary on Waiapu Road is via the Sanctuary Fence track, which crosses Waiapu Road and heads straight down to the stream. The track itself meanders for a few metres, but then heads straight up the other side of the valley. I tried following the stream itself for about 100 metres, but it soon became clear that this was a place where not many people went, and I didn’t really want to keep going on my own, especially with it beingvery likely that the streem would reach a tunnel underneath a steep bank, and I’d have no recourse except to re-trace my steps and climb back to the road where I began. Gaiters would have been very handy in this area. I didn’t quite go back up the path I came down, but instead followed a steep route up the side where it looked as if people had been before, and ended at a miscellaneous-looking manhole cover next to a power pole on the road not far from where I started. as it gets further from the sanctuary. up the bank to Waiapu Road. Wandering back to Birdwood Street, which crosses the valley through which the Kaiwharawhara River flows, I looked for any sign of a stream below, but I couldn’t see any. Turning around, appeared as if the stream must be getting piped for quite some distance because standing at the lowest point in the valley, all that was around was a grassy field. 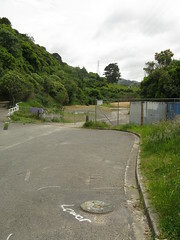 Judging by the surrounding hills, if the stream was visible it would have carried on down into a valley between Chaytor Street (the main route up to Karori) and Curtis Street (towards Wilton). There are houses in the valley but there wasn’t any obvious way down via any public route to look for a stream after a reasonable look on both sides. 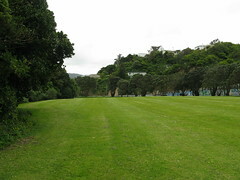 From previous experience I knew that the Kaiwharawhara Stream flows through Otari Wilton’s Bush, on the far side of Ian Galloway Park, so I made my way towards there in the hope that I might be able to back-trace the stream when I found it. 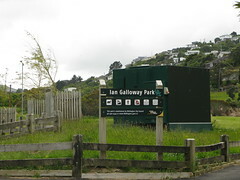 For the entire length of Ian Galloway Park, no stream was visible although I thought for a moment that there might have been a waterway in a ditch between the sports fields and the Karori Cemetary, which reaches right down the hill to the edge of the park. At best there were only marginally damp swampy areas though, which might act as some kind of minor waterway when it’s raining. edge of Otari Wilton’s Bush. Otari Wilton’s Bush begins on the northern end of Ian Galloway Park, and it begins with a further descent down to the stream. I finally heard the stream to the left of the track after a drop of about 20 vertical metres, and pushed through the trees to find it finally coming out of the tunnel. I guess the stream has been piped deep underground for that entire distance, which must be on the order of about 1.5 kilometres. 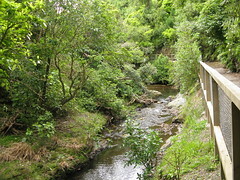 Now that it’s emerged from underground, the Kaiwharawhara Stream follows an open route along the length of Otari Wilton’s Bush. The path along this section is wide and flat and and easy to walk, although it’s possible to walk up the hill to Churchill Drive in Wilton, or otherwise to cross the stream and follow some of the less graded tracks up the hill on the other side which eventually lead to such interesting places as the Skyline Walkway. Being specifically interested in the Kaiwharawhara Stream on this occasion, though, I continued to follow it out the other end of Otari Wilton’s Bush to the parking area opposite a street called Blackbridge Road. It’s at this point that the Kaiwharawhara Stream once again heads into a pipe, although this time it’s only to go underneath the road. Unfortunately, there’s not much on the other side of that road in the way of nicely graded walking tracks. It’s possible to push through long grass and climb down to the place where the stream once again emerges, and for a while I considered trying to follow the stream-bed in its north-eastish direction. The stream-bed is quite overgrown and its full of slippery brown rocks. If it were a regular tramping trip it’d probably be the sort of thing that could be followed easily, but once again I wasn’t really in the mood, especially since I knew it was likely to head straight into another tunnel without much pedestrian access after a few hundred metres. So, after climbing back up to the road, going on a quick detour up towards Crofton Downs and deciding it was less and less likely to find a route back down to the river, I walked back and around to the Wilton side where prior experience told me that I could get back down to the Kaiwharawhara Stream via Wellington’s Northern Walkway. Specifically, I followed the road to the end of a street called Hanover Street, and entered the region known as Trelissick Park — the next main area that encompasses the waterway. 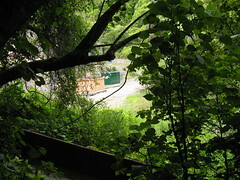 By this point, the route has crossed the Johnsonville Railway Line (which followed a tunnel somewhere underneath Hanover Street), and somewhere further along, the Kaiwharawhara Stream emerges from another pipe underneath the railway line. Walking down from Hanover Street, the path very quickly crosses the stream and continues on its true left, but rather than follow it straight away I decided to go back up-stream and locate the point where it emerges from under the railway lines. This doesn’t take long to do, but it involves some reasonably steep climbing because the path diverges from the stream due to it becoming quite gorgey. 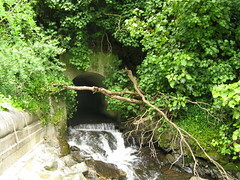 A sign-post eventually points to a feature called the “fish ladder”. 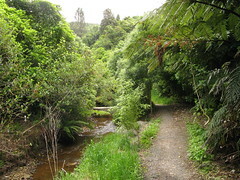 After about a minute of walking down-hill the path reaches the confluence of the Kaiwharawhara Stream (by now a small torrent that rushes out of a tunnel), and the Korimako Stream, which is the other main tributary from here on. A group from the Tararua Tramping Club visited that area last year and followed it up to Mt Kaukau, and briefly wrote about it, including at least one 200 metre torchlight procession through one of the underground sections. 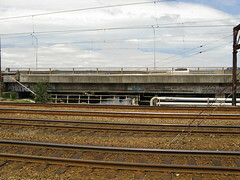 from under the railway line. 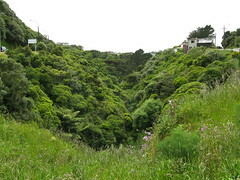 Looking down the Ngaio Gorge from the confluence. 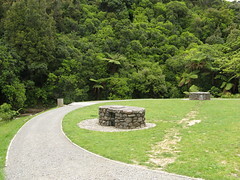 the Ngaio Gorge Track in Trelissick Park. 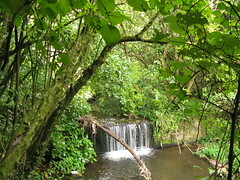 Trelissick Park is another very nice walking area, and the path alongside the Kaiwharawhara Stream, which soon becomes a track called the “Ngaio Gorge Track”, is well graded and easy to walk. Along here, the stream itself becomes a slightly deeper and meandering waterway that moves at a slower pace. Among the many people I met, many were walking dogs. The bird-life in the area was populous, and on one occasion I stood underneath two Tuis within a metre of me, who were having a noisy discussion about something for a good two minutes before they fluttered away to find somewhere else. Further along, a mallard duck was trying to coach her ducklings to swim against the current up the stream, but without much success. 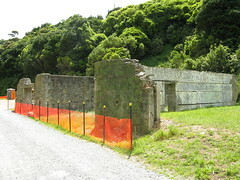 Remains of the Kaiwarra Magazines. 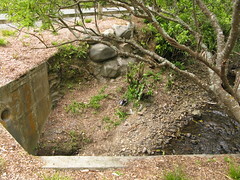 A notable feature of this part of the stream is the remains of the Kaiwarra Magazines, which were concrete structures built in 1879 to store ammunition, supposedly so it wouldn’t have to be carted through town which had been becoming a concern. Since the army vacated the premises in the 1920s the buildings have been used for several other businesses including panelbeating and plastics manufacturing. The city council decided to restore one of the Magazines to its former glory in 2000, but near the end of this process it was burned to the ground following a bank robbery, after which the perpetrators used the nearly-restored building to hide and burn their stolen van. What remains are two stone skeletons have a lot of history. This is the last part of the journey where the Kaiwharawhara Stream is enhanced by relatively natural surroundings. From here on, it flows through Kaiwharawhara. Kaiwharawhara is a reasonably industrial suburb, on the outskirts of Central Wellington. 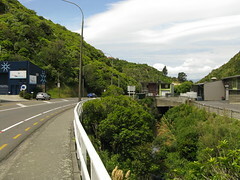 Its most known feature is Hutt Road, which is the main route out of town running parallel to the motorway. Being a long and wide road with lots of space to park cars, Hutt Road is a haven for businesses that don’t rely so much on impulse buying and foot-traffic. I think the most common kinds of shops on Hutt Road are furniture shops and especially bed shops, but there’s also the occasional car tow-away or mechanics business. I walked past at least one place with a sign out the front which proudly proclaimed “boxes sold here”. 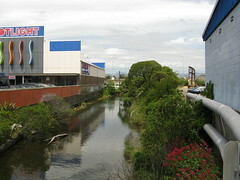 For the rest of its journey through Kaiwharawhara, the stream becomes more of a ditch between Kaiwharawhara Road, which follows into a traffic-light intersection with Hutt Road, and a collection of industrial businesses. It’s channeled under bridged driveways, eventually under Hutt Road between Spotlight and Beaurepaires for Tyres, both of which are reasonably large warehouse-style businesses that don’t provide a lot of space for walking next to the river ditch. 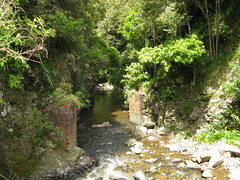 The stream then flows underneath the bridged railway tracks and the motorway, and finally out to Wellington Harbour. The final journey out to sea. I hoped to find some kind of legal way to follow the stream all the way to the coast, but unfortunately I couldn’t. There’s no clear way over the railway tracks anywhere near the stream. Even if there was, there’s no clear way over the motorway. In a last ditch effort, I walked a kilometer up the road to the ferry terminal in the hope that there might be some way to get back along the harbour coast, but there wasn’t. It was all fenced off. It’s an anti-climatic and largely uncelebrated ending for a water catchment that’s impressive in the amount of populated area that it covers, but not very well known in its entirety by many of the people who live around it. Last views of an interesting waterway. And that explains my walk. It ended up being quite a long day but it wasn’t especially strenuous, which I think is why I was able to handle it even after I didn’t fell up to a summit bagging trip we’d arranged for around Mt Ruapehu. I’ve been to most of these places before where it be in separate walks that crossed Otari Wilton’s Bush, or something like the Northern Walkway which visits Trelissick Park, but this was the first time I’d tried to walk the length of the stream just to see where it goes. I’m not sure exactly what’s next in relation to this. 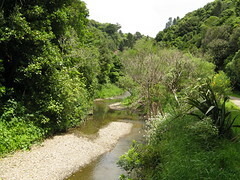 It might be interesting to have a look in the Karori Wildlife Sanctuary to get a better idea of where the Kaiwharawhara Stream begins, and it might also be interesting to follow the Korimako Stream, which makes up a major part of the catchment. Whatever it is, I guess it’ll have to wait until I have another spare day. 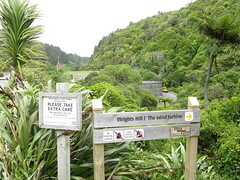 This entry was posted in daywalk and tagged daywalk, independent trip, karori wildlife sanctuary, otari wiltons bush, suburbia, tararua tramping club, wellington. Bookmark the permalink. LOL – I did a portion of that very same walk on Sunday! (We just did a short stroll from Crofton Downs.) What are the odds? I’ll probably blog it sometime over the next few days. Neat, I’m looking forward to it.